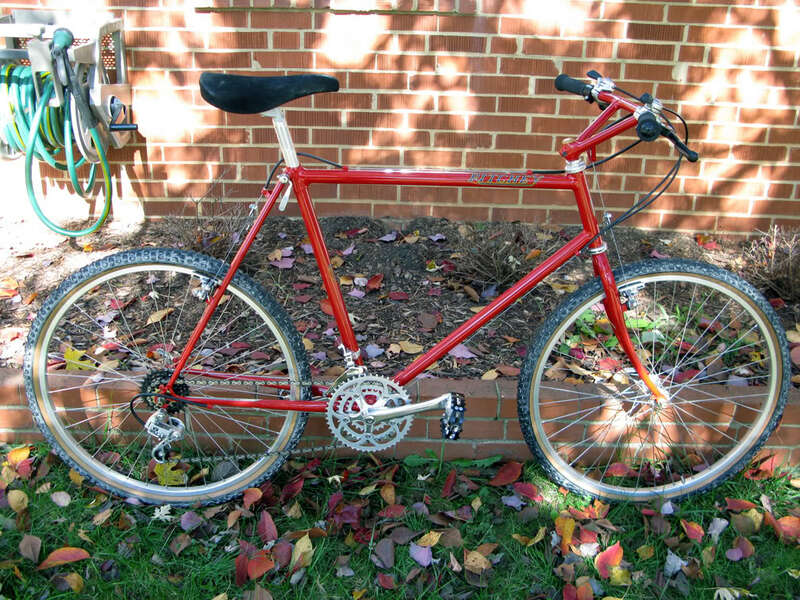 For a brief time, I had a 1983-84 Takara Highlander, a very early MTB with cro-moly main tubes and probably hi-ten everything else. I trashed the chainstays and it ended up on the scrap heap but I miss that old bike and would like to someday get a higher quality repack geometry bike. I know that the early Stumpjumpers had longer forks than the Ritchey MountainBikes that inspired them and thus, slightly different handling characteristics. Did other early-to-mid 80's MTB's also share this characteristic? Based on experience, what are some of the better handling MTB's from this era? 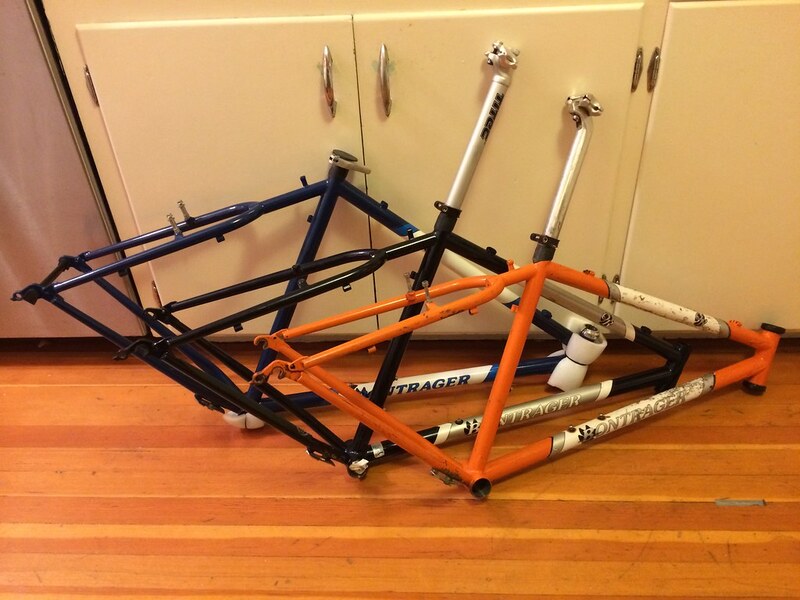 I'm not holding out for a Ritchey or anything of that caliber but I would like to eventually find a decent (ie, all cro-moly, preferably with a bi-plane fork crown but not required) mass produced frameset I can have powdercoated and then build up with mostly modern components. How long did the Repack geometry last? 1985? 1986? 1987? I know that Specialized, Schwinn, Trek, Univega, Mongoose and Ross all made Repack style MTB's. Are there others I'm missing and can keep an eye out for? Last edited by corwin1968; 11-19-15 at 07:57 AM. Can you explain the term "repack"? Ditto - is it related to chain stay length? Sorry. "Repack" geometry refers to the first MTB's with geometry that was basically copied from the old Klunkers. Long chainstays, very slack angles (70 seat, 68 head, for example), 2" rake to fork, high bottom bracket, level top-tube, etc.. They are incredibly stable at speed, have a ton of wheel flop at slow speeds and are like a Juggernaut when they get rolling. Really fun bikes. 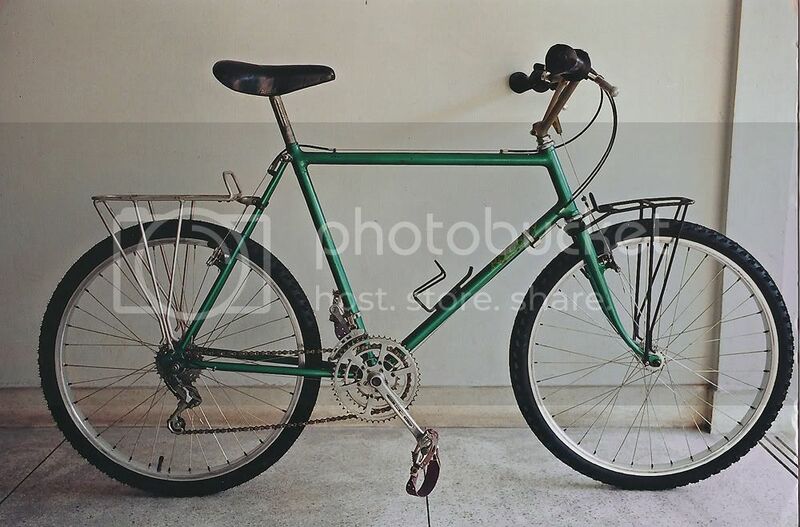 Some time in the mid-to-late 80's, the geometry changed to steeper angles, shorter chainstays and less fork rake. I believe this is commonly referred to as "NORBA" geometry. Leaned so much already and the day has just started! My early 80's Univega Alpina Uno betrays its klunker heritage in its odd headset size: the head tube diameter requires a headset with 32.5 mm cups, the standard size for cruisers, klunkers, BMX bikes, etc. And it takes a 21.15 mm stem. Not that it's any sort of standard, but I refer to the "old MTB" geometry bikes as ATBs. I seem to recall the "all terrain bike" term used in ads from the time- and truthfully, with all the rack, bottle and accessory braze ons-they were designed as "do everything" in "all terrain. " Would that mean that the MTB evolved from people customizing their everyday rides until they found a combo that worked? Then the companies started producing bikes based on these custom rides? With a title like this- we'll see if Charlie Kelly shows up. I think it's more a matter of these old bikes being available as used bikes. Stingrays and racing bikes had become fashionable, and old balloon tire bombers, when you could find them, were dirt cheap. So some crazy Californians would use them basically as disposable bikes, coast down the hills a few times until the frame or fork were trashed, and move on to the next one. 1981. Mt. Shasta, California. The first annual Whiskeytown Downhill. You should check out the documentary "Klunkerz" and Charlie Kelly's book! He's pretty active on the MTBR forum but I don't know if he posts here. Short version is that a small group of people in Marin county started riding old fat tire cruiser bikes off road and they then started modifying them with better brakes and derailleurs. Charlie Kelly then started a downhill race that occurred several times a year for a few years (where the "repack" term came from) and then people started building custom MTB frames that would accept new components. Joe Breeze was the major custom builder and then Tom Ritchey started making frames and Charlie Kelly and Gary Fisher started building them into bikes and selling them. These were basically cro-moly frames in the shape of a road frame but the same geometry (ie, repack geometry) as the old cruisers they had been modifying. Specialized basically copied one of the Ritchey bikes and made it the Stumpjumper and from there it just exploded across the world, in just a few years. Most early '80s mountain bikes you find will be like this. There are three Jamis Dakotas on our local CL right now that look like they'd be a match for what you want, but I'll bet anything you find from pre-'87 will do. Stick to pavement .. 1st Stumpjumper models sucked climbing .. its either wheel spin or wheelies .. I have 1 as my winter bike... Studded snow tires .. as a street bike, its fine.. 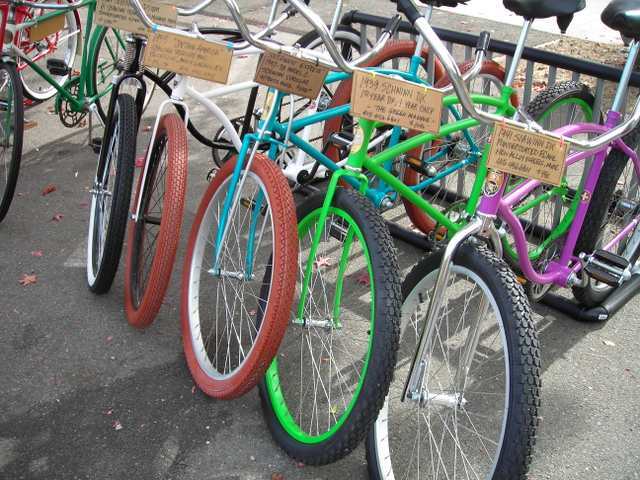 Some Klunker tribute bikes I saw in Marin. These will probably never be taken off road. 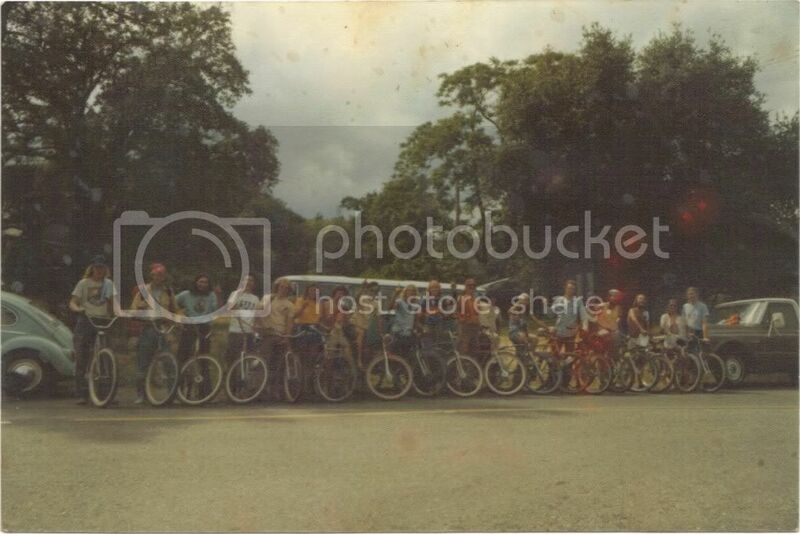 Schwinn Excelsior frames were popular. I'm not really interested in MTBing, but just how the bike evolved. It is an interesting thread like the old Hobbs bike thread. For some reason, this thread made me think of the Radio Flyer movie. BTW, I am a RVA local like you. I'm out in Chesterfield County. I'll have to dig up the pic of my old mountain bike build, back when these things were first coming out. I found a damaged A-D Inter 10 frame (all 531 with 73/73 angles) and stuck a CroMo cruiser fork in it. Shorter wheelbase and steeper angles than contemporary production mountain bikes and it handled great, and it predated the NORBA geometry by about 5 years. Add Miyata to the list. They had a few early/mid 80s models- RidgeRunner, TerraRunner, and StreetRunner. Varying tubing and component quality. They were all 34# tanks, at least starting out. 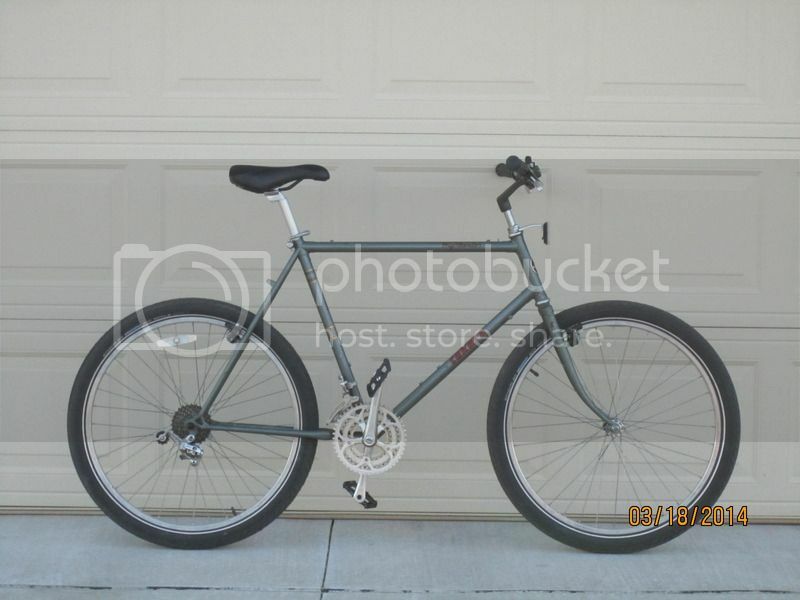 Ive wanted a 23" Miyata/Ross/etc ATB frame for a long time...just never see one local and cant consider the ebay pricing when they sometimes come up. 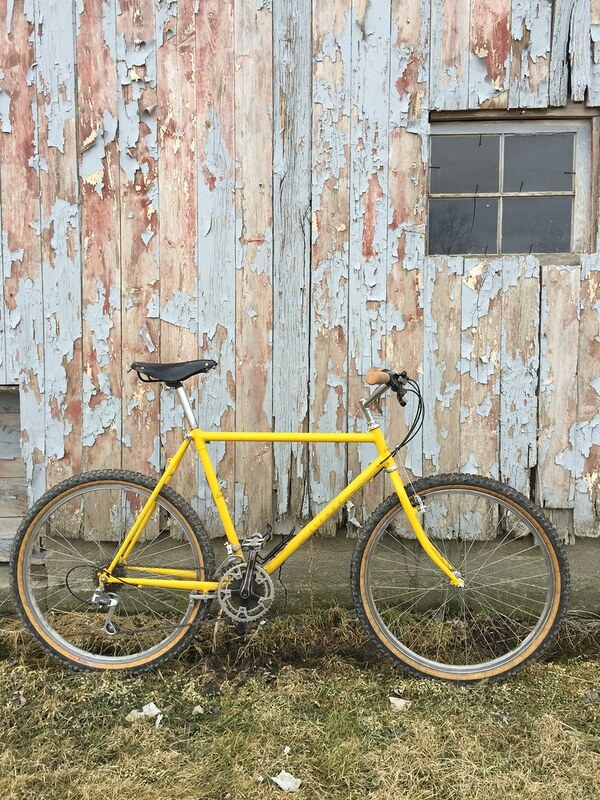 Here's my 1984 Fillet brazed Fisher Mt. Tam. Climbing anything steeper than a driveway is a chore, but I still love it. Find More Posts by simpleton. 1984 with U-brake/roller cam under the chainstay? Fillet Brazed bikes rule! I love the way the tubes flow into each other. That's what I'm talking about! 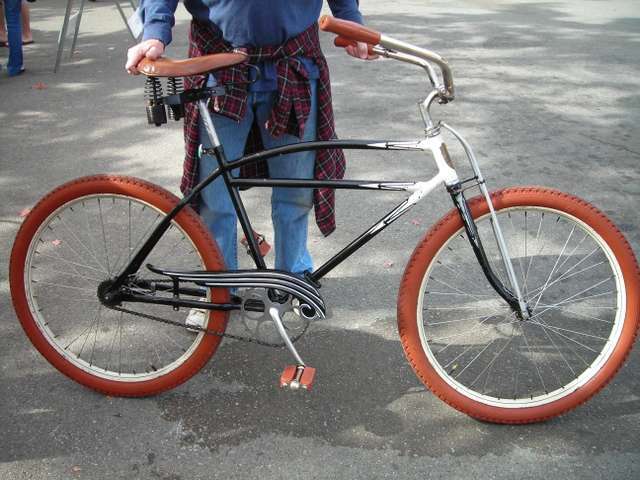 Do you know if it was personally built by Tom Ritchey, given that it's fillet brazed? How long did the Repack geometry last? 1985? 1986? 1987? These of course are pretty rare these days and not cheap. I'm mildly obsessed with early/mid 90s Botrager frames which are probably some of the quickest handing mtb frames out there. So probably the exact opposite of what you are looking for. Maybe an mid/late 80s Bridgetsone MB-1 or MB-2 would be good for you? He is a remarkably good writer AND he kept really good notes BITD. Lots of fine photos, to boot. The Fisher bikes were NOT built by Tom. They'd parted ways by that point.